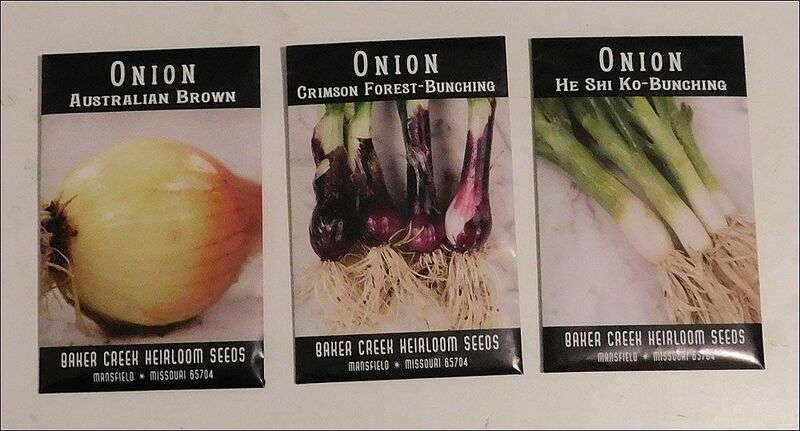 I buy from Baker Creek Heirloom Seeds. Somehow I got one of their seed catalogs a few years ago and found they have a huge variety of seeds, seemed reasonably priced and delivered my orders pretty quick. And they are Missouri natives too, so I've stuck with them. I have bought some seeds locally at Home Depot, but I'm going to cut back on that and try and go all heirloom in the future. In a small scale garden like mine, and a few years from now when I retire and move into my sister's backyard to turn it into a micro-farm, having plants that I can collect seed from and reliably replant the next year seems a better idea, than depending on commercial seeds. Also I plan on having a small attached green house, that should allow me to extend my seasonal grow into the Late Fall and get an early start on seedlings. Last year I planted white and red onions from onion sets bought at the local hardware store. They were ok, except for my earlier mentioned mistake of planting them with carrots. I happened to run across a "down under variety" in the Baker Creek seed catalog that showed some interest, Australian Browns. I also ran across a new onion, from Japan, a He Shi Ko-Bunching onions. I try and do a stir fry once a week and like onions in it, so they seemed a good choice. I planned on planting 2/3rds Australian Browns and 1/3rd He Shi Kos. When I got my seed order Baker Creek had included a free packet, which turned out to be another bunching onion, this one a Crimson Forest-Bunching onions. These seemed to be a bunching with a slight bulb. So I'm figuring something like 3/5ths Browns and 1/5th each of the bunching. 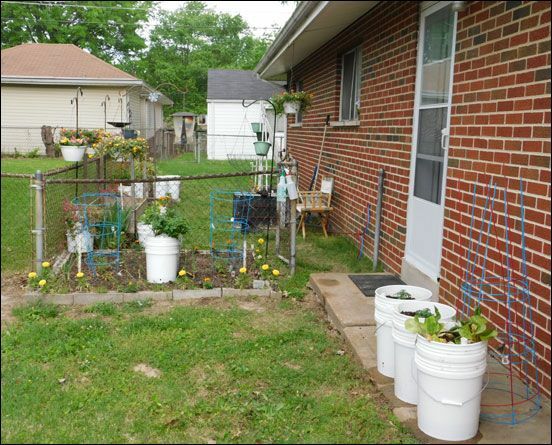 Just to remind everyone, here's pictures of my garden. The Australian Browns will be planted in the entire back bed, with enough space for a later planting of carrots in between. The variety I'm planning to try are Parisiennes, which produce a almost round onion type of carrot. There is a second similarly sized bed on the other side of the white containers, which I plant three tomato plants (in ground) and two pepper plants (in containers), but there's about 12" of forward bed that will get one of the varieties of bunching onions and then some Chantenay Red Cored (5 inch) carrots. I have three varieties of tomatoes to try this year. For one side of the trestles, a small cherry type called Brad's Atomic Grape", and then for the other beds either Raspberry Lyanna, a variety out of Russia, or German Lunchbox, both smaller tomatoes. I've not had much luck with the larger tomatoes, either they crack or get pests. My sister likes large tomatoes sliced but I prefer to quarter mine and eat them in larger bites either in salads or as sides in a meal. 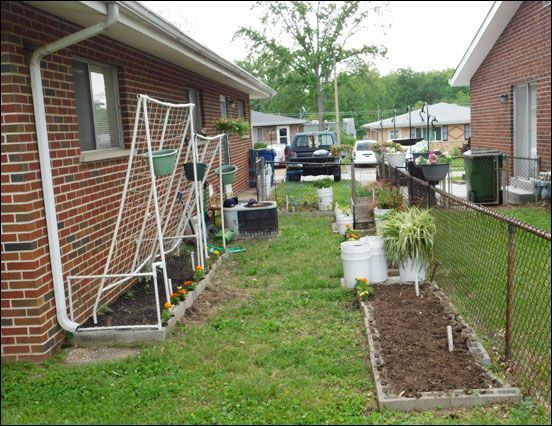 The front larger bed has about the same, a front 12" of free bed on either side of the fence. It will get four tomatoes and two pepper plants. Haven't decided the pepper varieties yet. One side of the front bed will get Little Fingers carrots (3 inch) and the other Short n' Sweets (4 inch). And the other variety of bunching onions. Like I mentioned I seeded my onions about 10 days ago with two garden flats (36 cells each) . The Browns are starting to come up. I've always started via onion sets, that is small bulbs already grown. 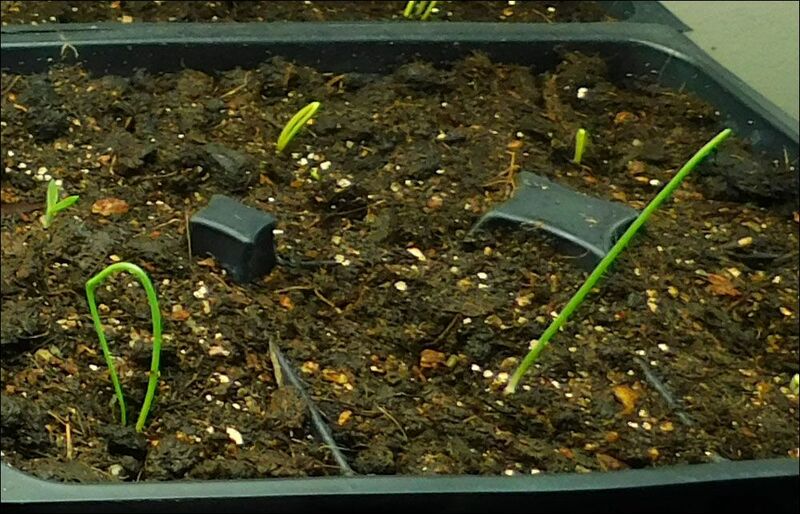 Its interesting to watch the onions come up from seeds. Apparently they grow a leaf in a loop, until at some point the top tip breaks free and then lifts up into the air. Here's a close up. Notice the onion on the left still has its tip in the ground, while the one on the right has broken free and now stand up. The Browns were seeded about a half inch into the soil in one hole per cell, with two seeds per hole. As well as the Browns have germinated, the bunching onions, also seeded into two garden flats, haven't sprouted AT ALL. Now I did surface seed instead of pushing them into holes. I'm going to stir the soil up slightly and see if I can get the seeds into the soil. Perhaps that will get them started. We'll see. Remember, this is about 10 days of germination. I also raised the lights. They have been sitting about 2 inches off the containers. I wanted to start small, so I used some 48 oz (1400 ml) plastic food containers. I filled them with seed starter soil up to about an inch from the top. From left to right these are lettuce, peas , bush beans and sunflowers. The only one to disappoint was the beans, one three out of the eighteen seeds sprouted (though a few more look like they want to now). 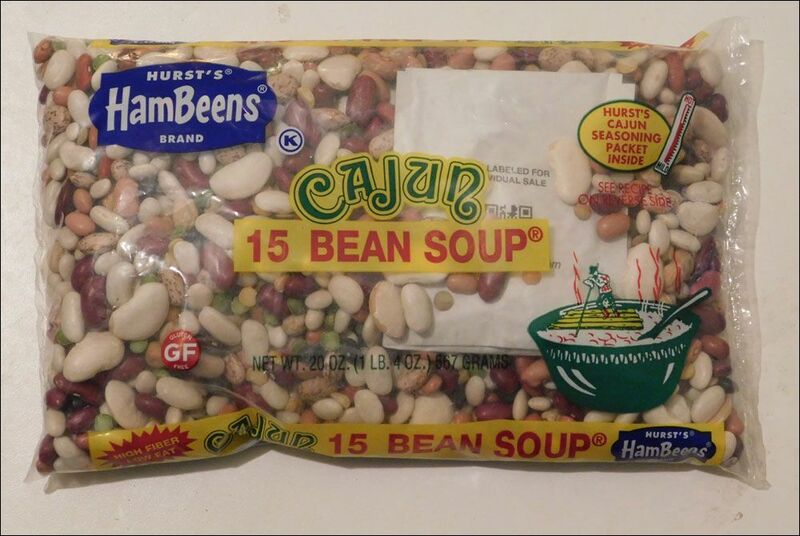 It might be that I choose beans that were too large. I didn't write down the variety at the hardware store. They have several other types and I'll try them too. The sunflowers were clear winners followed by the peas. Almost all sprouted with large sprouts. i expect by the weekend (14 days of growth) I could harvest them for stir fry. Here is a close up of the sunflower sprouts. Strong sprouts and big leaves. Here are the peas. Both of those, as well as the beans were seeded with 18 seeds. The lettuce on the other hand had probably 50-75 seeds. They still have tiny leaves and stems so its probably 2-3 weeks before harvest for those, still I'll be interested to see what a full container of them looks like. 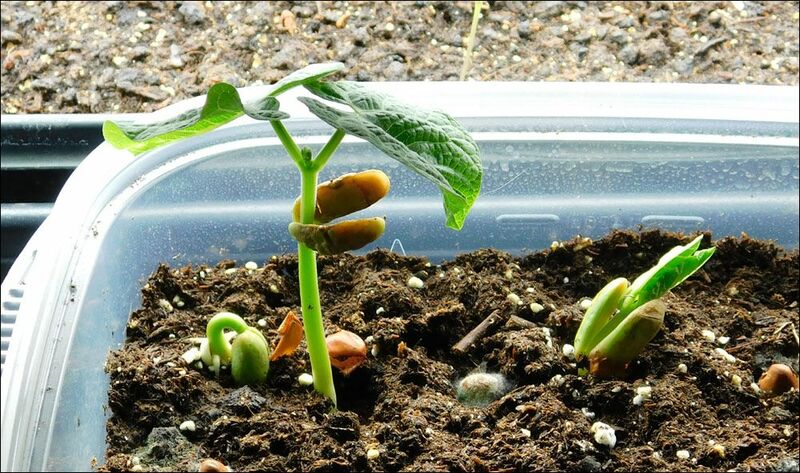 While the beans were a disappointment, the three that did germinate offered a picture perfect image of beans sprouting, with one breaking ground, one just opening, and one sprout with leaves to add to the Bean entry in the Book of Plants. I also came across this at the grocery store after my seed buying trip to the hardware store. I paid $2 for 3 ounces of bean and pea seeds, and yet here is 20 ounces at $2.50. Hopefully the company didn't spray these seeds with a chemical non-sprouter. Still I'm going to try some of these in a larger container and see what I get. I decided to ditch the seed flats as a growing medium and plant this next experiment in 5 gallon self watering containers. They are doing pretty good for just 10 days, 6 weeks to harvest being the planned interval. 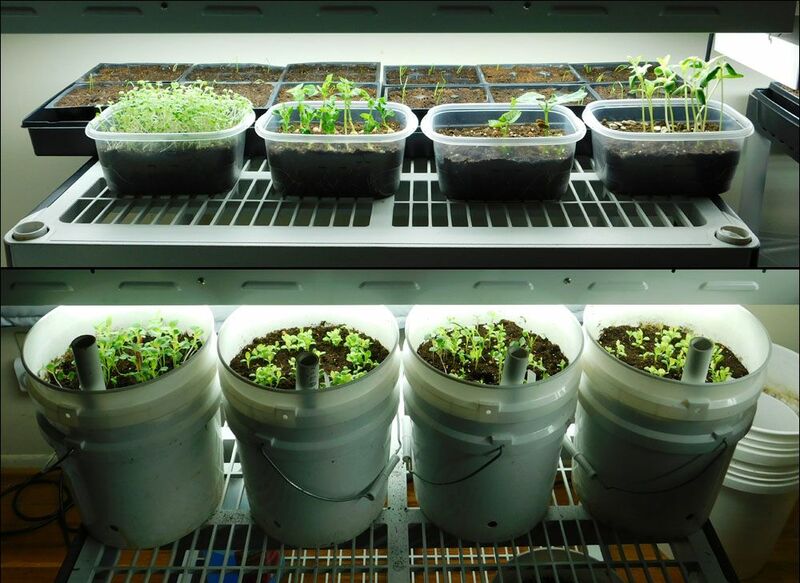 The grow lamps are also down within a few inches of the tops of the containers. Someone had mentioned that the way I had originally had the lamps in the first experiment, about 10-12 inches, probably contributed to the plants being very tall and skinny. Baker Creek has 4 different micro green seed mixes, I'll see how each does and report back. That's it for this week, now go out and plant some seeds, lol. 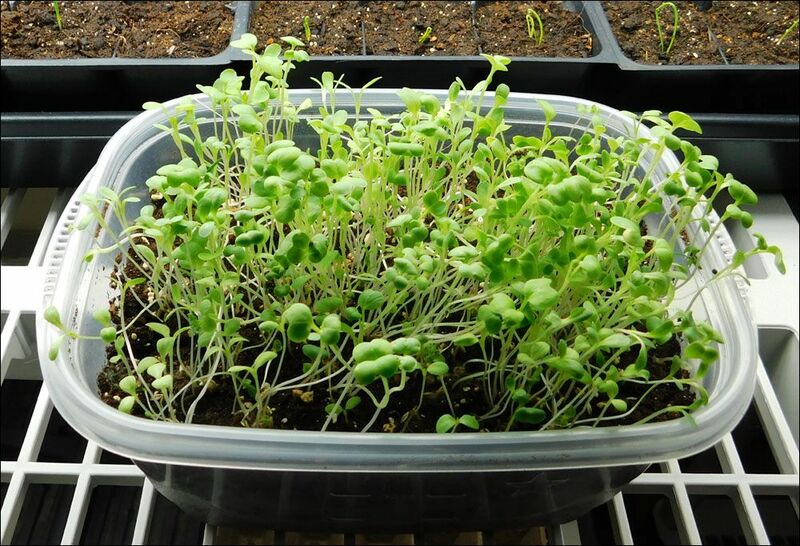 Please could you link to your earlier post on microgreens and sprouts too? Apologies if it's very obvious, I have had a brief struggle with the search function and given up. What growlights are you using and do you like them? I am considering getting some for growing microgreens for home use. 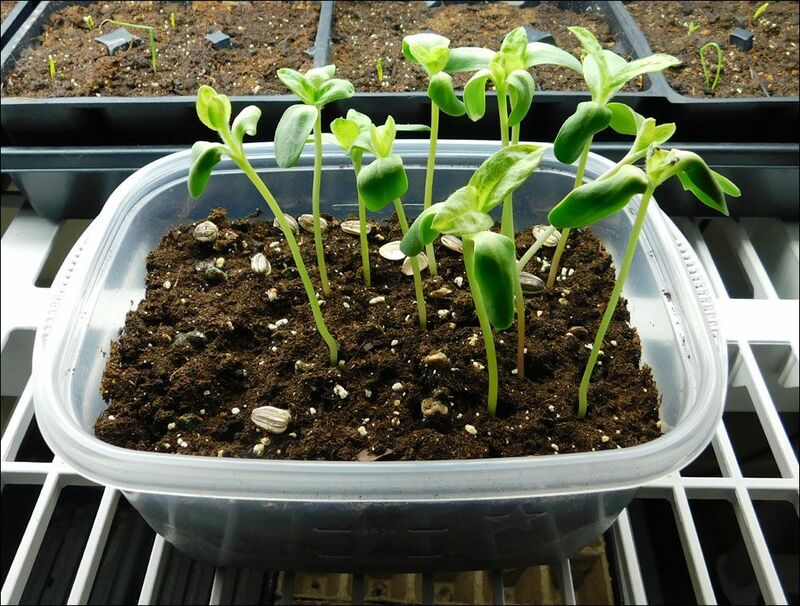 I have been growing sunflower seedlings and I prefer the flavour and texture for eating when there are just the deed leaves and before the first true leaves come in. 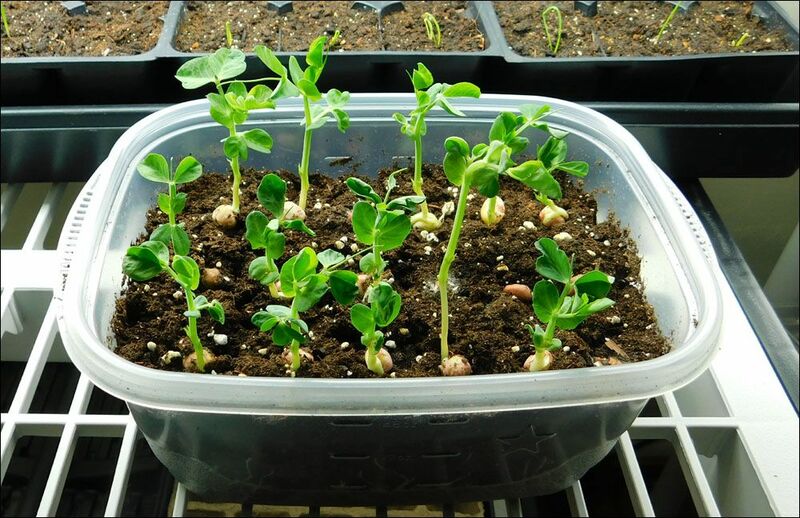 Also fenugreek seeds seem to grow pretty well for me as sprouts just in a tray that I rinse twice a day, I think it is an inexpensive way to get a salad ingredient. Sorry about your troubles with the Search Function. I know its on the fritz and its top of my list to fix. There are two updates I still need to move over but this one has the info about the grow lamps I bought. Cost Breakdown: I would have put everything in the basement, so that any water wouldn't be a problem but the only electrical is a single ceiling bulb, with one outlet in the fixture. The lights are made by a company called VitaPlant, and are 4 feet long, using four 54 watt fluorescent bulbs, for a total of 214 watts per fixture or 642 watts total. Each cost $140 ($160 with tax). They have a 5 year guarantee (1 year on the bulbs). I did some back of the envelope math on the cost. My latest electric bill has me using 243 kilowatts (kWh) during September with a cost of $37. Works out to about 15 cents a kWh. I have them on a pair of timers coming on at 5am to 7pm, or about 14 hours, for a total cost of $1.35US for about 9 kWh a day. Now this might be a problem during Winter depending on the solar electric system and its output. Something that is often very low then. I'll have to keep this in mind when thinking of how much output I will need. Thanks for your reply and details. I recently purchased an electric bean sprout machine from my local Asian Grocery and find it much easier than growing them in a jar as I only have to change the water once a day and the sprouts grow straight instead of curly. Mung bean sprouts take four days and it can produce up to a kilogram of sprouts per batch at less than a twentieth of the cost of supermarket sprouts so it won't take long to pay for itself. I am also going to try soya bean sprouts which are supposed to grow in two days. What Brand of Sprout Machine? What kind of electric bean sprouting machine did you find? The Mung seeds look interesting, I'll order some. For the mung bean sprouts I just use use beans from the asian food shop. The soya beans aren't growing as fast as I expected, will see how they go. I've never had much luck with onion seeds so have used onion plants from Johnny's which worked well. I have all kinds of misc. things to put under my trays to keep them close to the light so they don't get too leggy. Then just pull them out when the plants get larger. I was going to agree with you until this last week. It may be that my choice to not put the grow lamps on all the time has been a factor in their lack of germination. They have been getting about 5-6 hours of light which warms the soil up quite a bit, and the rest of the time no light, with the indoor temp around 65-70. Kind of like early Spring. This week the Browns have come out great. 45 out of the 72 cells have one or two seedlings sprouting. I put two seeds in each hole. Here's a pic. The bunching onions clearly prefer being into the soil. I'm getting a bunch of seed sprouting now. The micro green buckets are progressing nicely. And the sprouts have two clear winners, sunflower seeds and peas. I'm going to do a larger size flat of both tomorrow to see what kind of weight I get. The lettuce flat is good but will require at least a week or two to mature. Onions seeds like some humidity and heat to start, and they also just take awhile. I start my onions seeds on top of a seed starting heating mat, and I cover them until they sprout to hold in humidity, usually there is a piece of plastic, like a bread bag cut open and flattened, to use. Or a piece of remay ( floating row cover) I dont use grow lights at all. This has been on off year, due to family emergencies that have been ongoing. Generally I start the onions first on the heating mat, before Christmas. Tomatoes and peppers then get started on the same heating mat when I move the onions off. Yes, I think I should have been doing this in December. I do notice that the bed next to the house with the trestles, where I planted early onions last year, now have some sprouting. I'm guessing they are from the onion sets I planted there, which did not sprout, since none of last year's onions flowered (and produced seeds). Which I have to remind myself this too, when I miss dates. Right now, it is all about skill building, so on with the next thing. For example, I know how to start onions and tomatoes, but did not this year. I seem to have trouble multitasking. So, this year I bought onion starts from Dixondale ( you can find their site online) they are not onion sets, they are little onion plants ready to transplant to your garden. They work way better than the dried onion sets. But, not as well as the seeds variety I can grow that is better suited to my location. But this year it will be the dixondale starts, so then I can practice storage conditions some more..... Same with the tomatoes, I can and will easily buy some, but my 2 mainstays for this location, crimson sprinter and ropeco, are not available at any of the stores as starts, so I will have to make do with later or less tomatoes this year.